Ten Speed Press, 9781607744740, 320pp. Finally, a book that demystifies our daunting education system by giving parents the insights and strategies they need to build positive relationships with teachers and connect to their children’s learning in productive ways. • fuel your child’s mind and body for learning. Parent involvement looks different for every family and every child. Packed with real stories and tested strategies, The Parent Backpack demystifies our complex education system and gives you the insights you need to help your kids thrive. ML Nichols is director of The Parent Connection, a nonprofit parent education group. While serving in leadership roles in her own district and on Parenting magazine’s Mom Congress on Learning and Education, she launched www.theparentbackpack.com. ML lives in the Boston area with her husband and two daughters. A practical guide for parents of elementary-school children, The Parent Backpack explains how to muddle through an (often mystifying) educational system and help your kids thrive. With how-to advice on topics such as choosing a kindergarten, writing an effective note to your child’s teacher, or teaching good study habits, Nichols (the director of a non-profit parent education group) has packed the book with helpful tips and example scripts for conversations and e-mails. Each chapter ends with a list of “Top 10 Takeaways” for readers to refer back to easily. 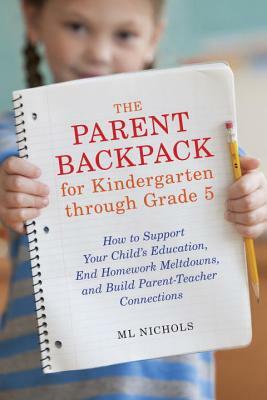 "In this approachable guide, Nichols offers practical advice to parents on everything from how to select a kindergarten program to how to write appropriate e-mails to your child’s teacher. Nichols, the director of the Parent Connection, a nonprofit parent education group, has extensive knowledge of the ins and outs of the early years of a child’s education. All parents will benefit from the early chapters providing specifics about the current generation of elementary schools, and suggestions for what parents can do to ensure their children’s success within the changing system."